Lula C. Naff makes her name in a male-dominated field. In 1904, Lula Naff began working at the Union Gospel Tabernacle, (later known as The Ryman Auditorium), booking boxing matches, speaking engagements, and concerts. In 1920, she was promoted to General Manager, and began to put Nashville on the map in the entertainment industry. She used the name L.C. Naff so she remained inconspicuous in a male dominated industry. She booked acts such as Charlie Chaplin, Harry Houdini, and Bob Hope as well as speaking engagements by Presidents Theodore Roosevelt and William Taft. Under her management, the Ryman hosted some of the first integrated concerts in the South. She continuously worked for what the audiences wanted to see, even if that meant putting her entire livelihood on the line. In 1938, she was forced to navigate the controversy over the play Tobacco Road. Considered immoral and sensational, Tobacco Road followed the triumphs and failures of the Lester family of sharecroppers. Several censorship groups in Nashville fought the play’s performance at the Ryman. 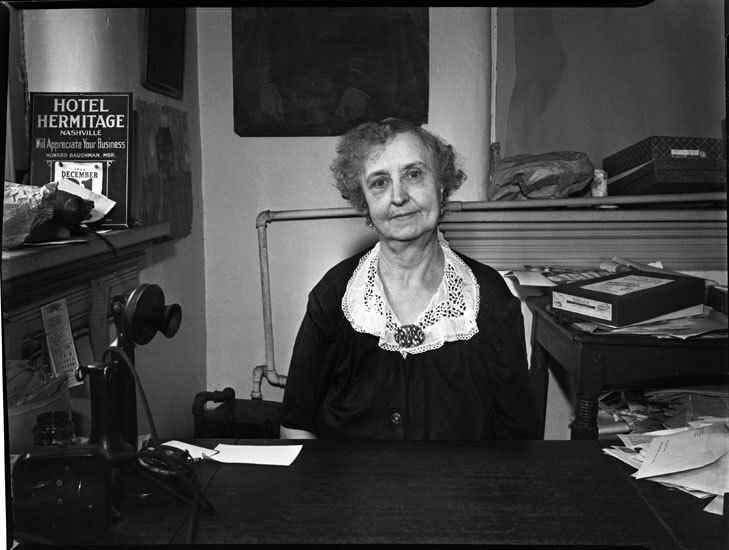 Lula Naff knew Tobacco Road would sell out because of its reputation, and wanted The Ryman to be a place to see the most modern acts in the arts. In a court battle against the Nashville Board of Censors, on November 21, 1939, Naff won the rights to produce the show. A gritty, tough woman, Lula did whatever it took to make the Ryman, and Nashville, a staple for performers. She mortgaged her house to bring tenor John McCormack to the Ryman; she passed out handbills and press releases herself. She oversold the auditorium and the show was an amazing success. Naff finally retired from her unprecedented career in 1955, and passed away five years later. The Ryman would not have gained as much prominence if it was not for Lula C. Naff, a woman working in a time when she was forced to change her name to mask her gender. She is now remembered forever with a plaque inside the Auditorium, as well as having the bar connected to the venue named in her honor. Tessa Antonelli, “The High Priestess of the Mother Church: Lula C. Naff,” Bygone Nashville, accessed April 25, 2019, https://bygone-nashville.mtsu.edu/items/show/15. Seigenthaler, J. (1960). Death in Sleep Takes Mrs. Naff. The Tennessean, [online] p.1. Available at: https://www.newspapers.com/clip/5315509/lula_naff_obituary/# [Accessed 8 Nov. 2017]; Eskew, H. (1955). 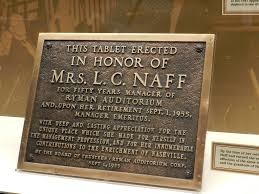 Mrs. Lula Naff Rings Down Curtain on Ryman Career. The Tennessean, [online] p.1. Available at: https://www.newspapers.com/clip/5303040/the_tennessean/ [Accessed 8 Nov. 2017].